Together with Confederation of Finnish Industries (Elinkeinoelämän keskusliitto EK), Oulu Entrepreneurship Society and Alltime, Spinverse facilitated the SMEhack to solve the global problem of littering. The hackathon for SMEs took place on January 28th, 2017 in Tellus Innovation Arena at University of Oulu. Littering is a global problem. Billions of dollars are spent on cleaning up trash annually. Maintenance staff spend many hours per day picking up trash instead of doing value-added work for properties. How can this be changed? Is there a way to make people throw trash into smart waste bins? Participants were challenged to come up with the answer. “The hackathon provides a low threshold opportunity for SMEs to find new ideas and business models” comments Outi Ervasti, Senior adviser at Confederation of Finnish Industries, who facilitated the SMEhack. 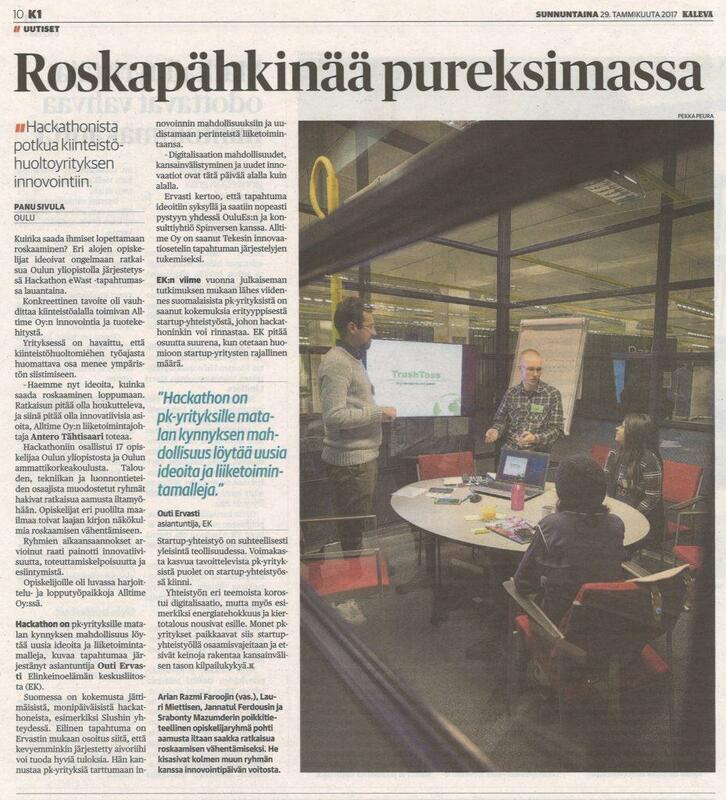 According to Ervasti, the hackathon in Oulu proves that great results can come from a smaller brainstorming session. She encourages SMEs to seize the opportunities of innovations and renew their traditional business. “The possibilities of digitalisation, internationalisation and innovations are the current trend in any industry” adds Ervasti. “Organising an SME specific hackathon is something new and serves as a new and cost-effective way to stimulate innovation and solve problems SMEs may not have resources to solve themselves”, says Mikko J. Salminen, Director of Open Innovation at Spinverse who also facilitated the SMEhack and gave a keynote about mastering ideation in a team and innovations. “Within one day we saw how existing problems that SME entrepreneurs deal with every day can be dealt with through innovative ideas”, he continued. Do you need help in organising a hackathon? Contact us for more information.